The renewable energy market is one of the fastest growing segments of the world economy and has a mandate to continue growing for many years. The mandate comes from large infusions of cash by governments to convert from a dependence on oil to the ability to control their own energy sources. The mandate comes from world populations that are committed to stopping the overuse of fossil fuels and the destruction of the planet. The mandate springs from the advanced technology that is being developed and will create jobs that we can not even imagine today. With the enormous growth in renewable energy, there will be hundreds of billions spent worldwide to create the massive numbers of wind turbines, PV panels, bio-fuel plants, and other forms of renewable energy required to replace the oil infrastructure that currently dominates the energy marketplace. To produce these products there will continue to be an enormous growth in renewable energy manufacturing capacity that occurred in the last 2-5 years. To meet the new technology in renewable energy product design, the need for growth in capacity, and the need to reduce the cost of renewable energy to compete against the low cost of oil driven energy production, the manufacturing of renewable energy needs to bring to bear the latest manufacturing technology. Lean is the best set of methods of manufacturing used by the best manufacturing companies in the world (Toyota, Honda, Ford, John Deere, GE, Danaher, and many others). Using Lean to produce renewable energy products will keep costs low, make the investment of capital more efficient, provide product in the shortest possible lead time, and ensure the continued growth of the industry. Using Lean will drive cost out of the products/processes allowing more conversion to renewable energy for every dollar spent. Some renewable energy manufacturing companies are using some Lean tools, but much more can be done to reduce the waste in manufacturing these products. Competition in renewable energy manufacturing is global. Suppliers are spread across the globe, as well as there are companies competing for the billions in sales of renewable energy products. The European manufacturing sector has a clear lead in the use, development and manufacturing of renewable energy products. China is a major customer for renewable energy infrastructure as well as a major player in manufacturing of renewable energy systems. There are new companies being started every day trying to take advantage of the huge growth potential in this market sector. The companies that will survive this competition will be those that merge great renewable energy product design with great manufacturing capabilities. Lean is the great manufacturing technique to achieve excellence in the manufacturing of renewable energy products. The companies mentioned like Toyota have already proven that Lean is the best manufacturing methodology in the world with the dominance and growth in their market sectors. What makes Lean the most advanced methodology to manufacture any product is its relentless focus on the elimination of waste. Eliminating the waste of labor, the wasted non-valued added steps of excess movement/transportation/material handling, the waste of capital on unneeded inventory, the waste of capital on excessive available capacity, the waste of excessive lead time and poor customer delivery that loses sales to the competition, and the waste of lost opportunity. This focus on the elimination of waste and a relentless pursuit to serve the customer makes Lean the best set of tools for any industry. Especially an industry like renewable energy where capital is critical to grow the business, where attracting capital to invest is critical, and where the competition against the oil energy business requires renewable energy costs to be controlled/minimized. The tools for the implementation of Lean must be more than just the improvement of a small set of processes in a manufacturing plant. The design, complexity and level of integration of the renewable energy manufacturing of the future will be too complex to be designed through small incremental improvements. The technology used to manufacture renewable energy products requires thinking outside the box, innovative manufacturing strategies, and factories designed/redesigned from order entry, through planning, manufacturing, receiving and shipping. The supply chain will require the integration of technological processes on opposite sides of the planet. The creation of this integrated supply chain will need to be designed to keep lead times and inventory investment at unimagined low levels, while ensuring the coordinated delivery of products to field sites for erection when needed. Not weeks before, or weeks after, but on time. Lean is the manufacturing and global supply chain design process that can meet these needs. There are many challenges for a renewable manufacturing company. The business has to be profitable at lower than optimum production levels. This ensures the continuation of the business through economic downturns and facilitates the persuasion of capital investment for growth of the business. A renewable energy company has to be able to grow with the phenomenal growth in renewable energy sector. This growth has to be in a disciplined and orderly manner, otherwise chaos becomes the order of the day and waste and costs grow faster than output. The challenge with the phenomenal growth is the availability of sufficient capacity, internally and in the supply chain. With the many exotic materials and processes used in the manufacture of renewable energy products there are often either allocations or insufficient numbers of suppliers to keep up with the 15-50% growth per year. Any limitation to material availability limits the output of the production facility. But gross overstocks of materials or components built to the crystal ball of the forecast will waste valuable capital and risk obsolescence. The Lean tool of pull creates the best opportunity to have material procurement signaled for by consumption not forecast. The Lean tool of pull must be a more sophisticated application of the tool using more than average historical demand to size the procurement quantity. The supply chain will need to go through a Lean supply chain design process that is flexible, innovative and capable of projecting demand into the future from a historical database. Without this ability to project demand based upon either demonstrated or projected growth the procurement of materials will always lag the need. This is especially important in an industry where components are large, expensive and have relatively long lead times. Procuring materials purely upon the forecast will lead to shortages in some materials, gross overstocks in others, long product lead times, missed deliveries, and customers withholding payments and future potential orders. The use of pull and statistically designing the supply chain mitigates these risks and provides the best opportunity to have the right materials at the right time. Pull is simply the procurement or completion of a sub-assembly/product based upon consumption. Think of a supply chain or factory as a pipeline with the pipe being a finite number of something in the pipe. Once room is created in the beginning of the pipeline for more material or product in the pipeline then more can be placed into the pipeline. If no room is created then no material or product is placed in the pipeline. If material or product flows out of the pipeline at a faster rate then more material or product is asked to be placed in the pipeline at a faster rate. The length of the pipe is controlled by the lead time. The quantity of the orders or shipments from the supplier is determined by the delivery frequency: daily, weekly, every 2 weeks, monthly. If a company uses 100 electric motors per day and the delivery frequency is daily, each shipment will be a quantity of 100 electric motors. If the lead time is 2 weeks the number of shipments from the supplier will be 100 electric motors times 10 days or 1,000 electric motors in the pipeline. When the number of electric motors allowed in the factory drops below the 300 allowed on-hand because of consumption in the assembly process, then another days worth of motors is asked to shipped to the company. The sizing/design of the total quantity in the pipeline, the amount in the factory, and the extra needed to deal with variation in demand is the mathematics behind Lean that is critical for success. In the manufacture of renewable energy products the transportation of the product can become a large components of cost for the product. 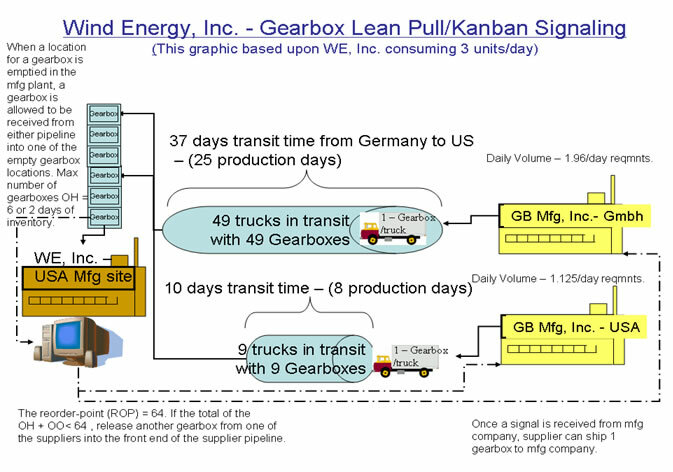 To minimize this cost requires a well thought through delivery strategy that ensures materials/products move to manufacturing or the customer based upon a clear signal: a toll gate or consumption of material that requires more material within the delivery lead time (see gearbox example for wind turbine manufacturer). Expedited shipping of large and expensive portions of a renewable energy system can cause enormous cost overruns. For these kinds of renewable energy systems, localized manufacturing of major or large components can reduce transportation, improve the completion of milestones on time, improve communication and reduce waste of scrap, excess material handling and improve the project planning coordination. Site erection costs for renewable energy projects require material to be delivered on-time, but not weeks before required. Early delivery causes issues with space availability, storage costs, potential damage, excess inventory value, and the waste of excess handling. Product or components delivered late means wasted labor, wasted equipment costs like cranes idle, missed schedules or completion of milestones, potential cash flow issues because of late completion of milestones and customers questioning the supplier capability. These costs can mount quickly if the delivery issues are more than just one-time events. A pull based system with every action designed and synchronized can lead to reducing all of these wastes and providing consistency and discipline to the renewable energy procurement, manufacturing, delivery and erection process. This pull based system will require a change to the planning of renewable energy projects from the supplier through manufacturing to the customer. Planning needs to become event driven planning with daily/hourly milestones, depending on the length of the manufacturing process. Events need to trigger actions in parallel as well as serially. This requires an extensive plan development upfront vs expediting during and after the planned delivery dates. This kind of radical change can not be envisioned or created in small incremental changes causing mistakes and constant back-tracking to recreate the flow, but most be driven through a Lean manufacturing and supply chain design process using mathematical algorithms and Lean tools. Using a big picture/holistic view of the entire process from order acquisition to order delivery/completion provides the opportunity to revolutionize the product manufacturing and delivery, to eliminate large portions of waste in the entire product delivery process. Also, with the constant focus on the elimination of waste in Lean manufacturing, the small wastes that can develop and easily be overlooked in large projects, are minimized and become less likely to turn into much larger overall issues and cost overruns. Lean should be implemented in a renewable energy manufacturing facility through the use of Lean Flow design strategies and mathematical algorithms based upon Takt time. Takt time is the frequency in time that a product or component must be produced, delivered, or erected to meet customer demand. The standard work time to produce the product/component within a process (like PV panel assembly, or Nacelle prep for assembly, or turbine blade trim, etc.) is standardized work. If the Takt time is to produce one PV roof top panel every hour, and the assembly time is 7.5 hours of PV panel assembly, the number of operations required to produce PV panels would be eight. At the designed demand level, there would be 7-8 people building PV panels. 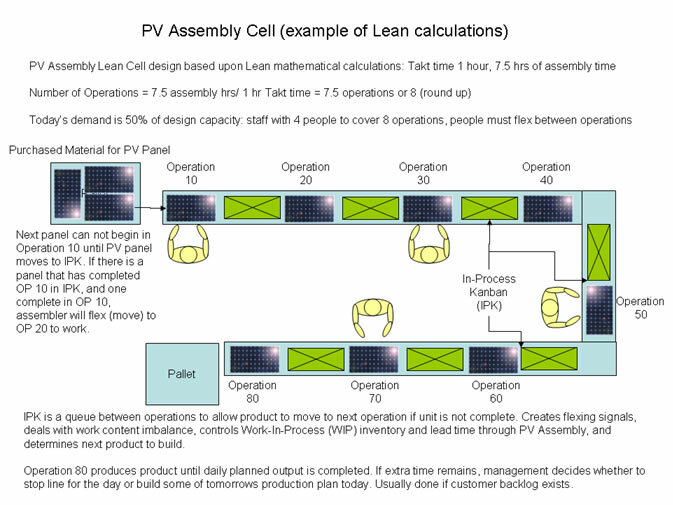 But a new PV panel would not begin until the panel being assembled in the 1st operation was completed and moved into the 2nd operation (see PV Assembly Cell Lean calculations diagram). This pulling of product ensures that no excess panels are in the factory that are not being worked on. Thus, Lean eliminates the excess product in queues waiting between processes not having work performed on it. This reduces WIP inventory, lead times, quality issues, and improves on-time delivery performance. This mathematical design approach is different than the traditional Value-Stream Map (VSM) and Kaizen approach to Lean. The Lean mathematics and engineering design approach is necessary to deal with the complexity of the technology in the product design and processes, the shipment and erection process, and the global supply chain. Using a VSM and trying to implement small incremental improvements will not work well or fast enough. Just as clearly designing a supply chain based upon average demand usage, or for the pull within the four walls of a factory only, excluding the external pulls from suppliers into manufacturing, is missing all of the power of a Lean Supply Chain design. Renewable energy manufacturing companies need to use pull through the factory, use pull within the factory to move materials, and pull between manufacturing or the erection site and the supply base. These are some of the basics of a company implementing Lean, but there is so much more potential for Lean as it is implemented in a renewable energy company. Is there commonly waste in the design engineering process at any company? Can waste be found in the order quotation process? Is there waste in the accounting function? What area of the business is perfect that can not be improved? Lean can show major improvements in all functions of the business, and all areas need to be trained in the tools and benefits of implementing Lean. If your business is a renewable energy manufacturing company and you have not begun the implementation of Lean, begin tomorrow. If your company has an implementation in progress, redouble your efforts, extend pull outside to the supply base and design the waste out of all of the business processes. The national energy infrastructure and the planet needs the energy infrastructure to be changed to renewable energy as completely and quickly as possible. We need the jobs and we need the growth in the economy that Renewable Lean can create.